CHC, Inc. is proud to announce that our very own Jayme Hannay, MPH, PhD, Robert W. Dudley, MD, MEd, and Paula K. Leibovitz, MS, RD, CDE recently published an article in the American Journal of Preventive Medicine (AJPM). The article is titled Combining Photovoice and Focus Groups: Engaging Latina Teens in Community Assessment, and it discusses ways to tackle female childhood obesity in the Latin American population of New Britain. Stephanie Milan, PhD, an Associate Professor in UConn’s Department of Psychology, also contributed to the article. Dr. Dudley was kind enough to share a few words about the experience, and we’ve provided those below. Enjoy, and be sure to congratulate these individuals when you see them around CHC! I’ve been doing community-based research on obesity for the past six years. I got involved because the issue was so frustrating: Eat healthier/exercise more. Everyone knows that. Why then do so many folks struggle and fail to make the changes needed to achieve and maintain a healthy weight? As a provider there is no pill, no simple advice that I can give to help my families. The more I looked at the issue, the more I realized that this is more than a medical issue. The obesity epidemic is the result of breakdowns at all levels of society from the individual to international. Fixing the problem is going to take interventions at all levels. 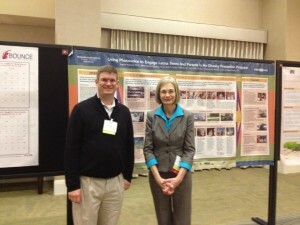 Robert and Jayme at the ACPM-AJPM Scientific Research Symposium-Salud America! Teens are tough to work with. Honest to a fault, and more than ready to blow your plans for a nice intervention up with a side glance and an attitude that says ‘Bor-ing.’ But they are also the future. Tomorrow’s parents- but also tomorrow’s diabetics, hypertensives, and heart disease patients. Healthy Tomorrows for Teens was a five year grant designed to directly engage teens in designing interventions to help build their confidence and health. It turned into much more. As part of a mid-course evaluation funded by the Robert Wood Johnson Foundation’s Salud America! Program, HTT used Photovoice, a photojournalistic research tool in which teens became researchers in their own lives, to assess facilitators and barriers to healthy eating and exercise in their communities. Starting with individual pictures taken in response to participant designed ‘framing questions’, teens and parents wrote reflections. Larger groups then selected pictures and identified common themes. These were shared in action orientated presentations local and state policy makers including at CHC, the Spanish Speaking Center, the YWCA, the school district, and the New Britain Common Council. ‘We live here, people don’t know how it really is’ was a common theme. A PE recovery program at the YWCA and a petition to reopen pools in troubled neighborhoods were two outcomes of this work. 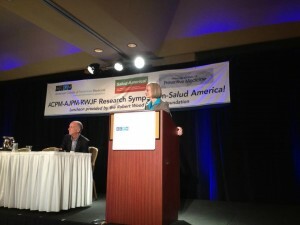 Jayme addressing an audience at the ACPM-AJPM Scientific Research Symposium-Salud America! Dr. Jonathan Oberlander, Professor of Health Policy & Management, University of North Carolina-Chapel Hill.